Oceanfront - 2 bedrooms, 1 bathroom, Excellent View of Ocean from upper balcony and lower patio and is NEWLY RENOVATED, This is an end unit and very quiet. Living/dining room, kitchen, patio and balcony. MW, DW, 2 Satellite TVs, DVD, WiFi. ONSITE POOL. NO PETS, NO SMOKING. ONE (1) SET OF BED LINENS & TOWELS PROVIDED. BEDS: 1 Queen, 2 Single. Accommodates 4. We stayed here a month and had a fine experience. 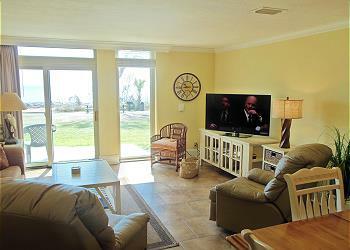 It's a fantastic location looking out at the sea, near Driftwood Beach and a marsh full of birds. This time of year (January), it's quiet and peaceful and the night sky is full of stars. Comfortable, bright, clean, well-maintained space. Easy rental and after-hours check-out.